It’s been 31 years since the Union Carbide pesticide plant in Bhopal, India leaked toxic gas into the city, killing an estimated 25,000, injuring half a million, & contaminating the environment & water supply. The leak, which went on from December 2nd to 3rd, 1984, was caused by neglect of safety systems to save money & is still considered one of the world’s worst industrial accidents. US-based Dow Chemical is now the owner of Union Carbide. Those who are veterans of the anti-Vietnam War movement remember Dow as the producer of napalm & Agent Orange–both used in the war. Napalm is an incendiary weapon used to burn people to death after excruciating pain. Agent Orange is a defoliate containing dioxin that caused at least 24 different health symptoms & death among veterans & their offspring–& continuing catastrophic health problems for the people of Vietnam. At the time it was used by the Pentagon in Vietnam, it was banned in several countries; Dow knew full well of the toxic properties of dioxin. That’s the kind of pathology the people of Bhopal are up against. In June 2010, an Indian court indicted seven former managers at Union Carbide for negligence, sentenced them to two years in jail & a fine of $2,100. Despite the political work of Bhopal & environmental activists & public outrage in India, the Supreme Court there upheld corporate impunity & turned down an appeal for harsher sentences. Two years later, a US court absolved Dow of all liability in the Bhopal disaster which means they are not liable for remediation or pollution-related claims. Local water sources remain contaminated with several toxic & corrosive chemicals, including lead, mercury, benzenes, & DDT. In 2012, the Indian Supreme Court ordered the Bhopal municipality to provide clean water to families for cooking, laundry, bathing. The source of water provided is not identified but the color is red, making it of questionable quality–especially for a population already adversely affected by the Union Carbide gas leak. 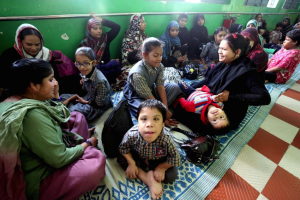 This photo is mothers with their children born with congenital disabilities waiting for treatment at a clinic for gas victims. The unaddressed environmental catastrophe means a second & soon a third generation of children suffering chemically-induced illness & neurological disabilities. The full weight for their care falls on families. They’re little human beings, cherished as all other children, & as we learn from disability rights, perfect just the way they are, but caring for a child with disability is an immense challenge families should not have to sustain without help. Bhopal is an ongoing crime. Though justice has been flouted with contempt, the demand has not yet been silenced. There’s enough criminality involved here to sink a continent. Our fullest solidarity with the people of Bhopal in their struggle to bring Dow to justice. The nightly news is giving advice on what to do if you get caught in a mass shootout. Oh mamma mia! How did life in the US come to this? The worst thing is, there’s no place to run for asylum since the US & its allies are bombing up the rest of the planet. Just so you know, the advice is run, hide, or fight. The alternatives are join a monastery or rebuild the antiwar movement. 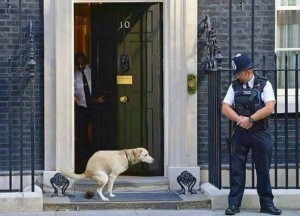 A dump at 10 Downing Street: This dog speaks for all of us after the vote last night to send more British warplanes to Syria. According to the morning news, the San Bernardino shooting is the 56th mass shooting in the US this year. The two shooters, who were both taken out by the police, were reportedly of Arab ancestry–one raised in the US & one in Saudi Arabia. That leaves 55 other shootings this year where the “element of jihad” was not possibly involved. That leaves 55 other shootings this year where the “element of jihad” was not possibly involved. Are Christians & other religions then shooting up this country? Since the US & Saudi Arabia have been allies in several monstrous wars beginning in 1990 from Iraq to Yemen to Syria, a compelling case could be made that those regimes are directly implicated when individuals in those countries resort to mass murder. Monkey see, monkey do writ large. As of now, police have not revealed the motives of two shooters who entered a California community center for those with developmental disabilities (cognitive and/or physical disabilities). The shooters killed 14 people (not yet identified) & injured at least 17 others–some very seriously. It seems inexplicable that those with disabilities would be targeted for violence but it’s actually the way in our world to target those seen as vulnerable–or most repugnantly, as inferior. We can’t presume the motives of the shooters but likely social hatred for disability played some part. My concern is personal because my younger brother Paul Francis committed suicide after four decades of abuse as a man with learning disability. The disability rights movement emerged in the 1970s when resistance to oppression & marginalization was the gestalt of the era for many groups. It was the era of identity politics when intolerance for every form of social hatred became the political clarion call. It was a glorious time in human history to see (& be part of) fightback of such breadth & see those looked down on as inferior stand tall with dignity & a proud sense of identity. We should take a moment to express our deepest condolences to those who suffered such trauma or who lost a loved one. We can render solidarity by committing ourselves to advancing disability rights.